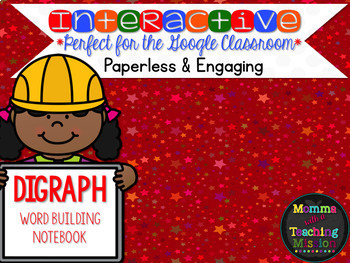 This is a great way to get your primary kiddos onto Google Classroom or Microsoft OneDrive. 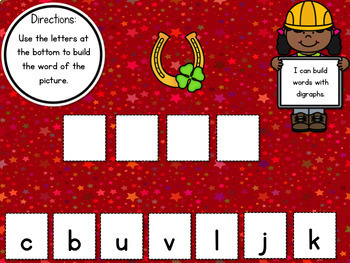 Students can manipulate each letter to move it to build the words with digraphs. This pack includes 30 different slides. 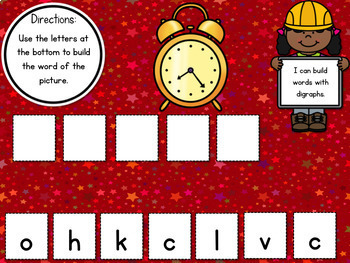 Each slide has a picture of a digraph word and 7 letters for the students to manipulate and move the letters to 'build' the word. Has your administration been on you to UP your integrated technology? Maybe you have struggled with how to infuse technology in your primary classroom. This is the perfect way to get your students engaged and interactive with their editing skills! Why should you use a Google Interactive Product? ♦Your administration is happy about the infused technology! ♦Web-based file sharing operates in the online 'cloud' and allows you and your students to work on and print files from any computer or device. This is compatible with Google Drive, and also works on Microsoft OneDrive.